GRAFENWOEHR, Germany — On Wednesday, March 2, the students of Grafenwoehr Elementary School joined other schools across the United States in celebrating Read Across America Day. Read Across America is an annual reading motivation and awareness program begun by the National Education Association. 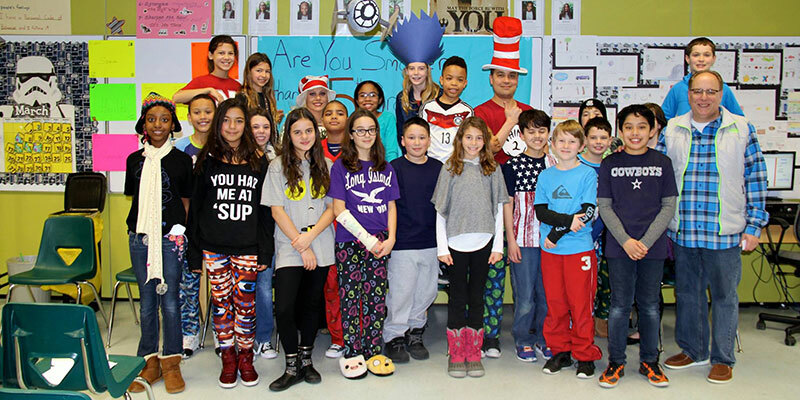 Many students came to school dressed up in their pajamas or as Dr. Seuss characters. The school’s plan was to read all day and we did! We had community volunteers reading throughout the school. One of our favorite readers was Mrs. Judith Brown from the Community Bank. AFN Bavaria’s DJ’s Da Flyin’ Hawaiian and C-Dub and joined us in celebrating Dr. Seuss’s birthday by reading to the different classes and eating green eggs and ham. After they read to all the classes, CDub challenged our very own Ella Scheuermann, who is the European Spelling Bee Champion, to a Dr. Seuss Spelling Bee. C-Dub was representing Dr. Hunter’s Class and Da Flyin’ Hawaiian was representing Mrs. Sobey’s class. After some arduous questions, Da Flyin’ Hawaiian won the game. The two DJ’s went to the main office to announce that Ian Velez won the drawing for a Dr. Seuss quilt that was made by several teachers at the school. “I wish every day was like this one,” said fifth-grade student River Rocha. We honor Dr. Seuss for writing entertaining books for people all around the world. Adults and children still enjoy his stories and creative drawings. His books inspired several movies such as The Grinch Who Stole Christmas, The Lorax, The Sneetches, and The Cat in the Hat. Our Read Across America Day was planned by Mrs. Heinzmann and Dr. Hunter. Editor’s note: This article was written by elementary school students and was released with permission from Grafenwoehr Elementary School.